New Delhi. The Indo-Pakistani War of 1965 was a culmination of skirmishes that took place between April 1965 and September 1965 between Pakistan and India. This war started following Pakistan’s Operation Gibraltar, which was designed to infiltrate forces into Jammu and Kashmir to precipitate an insurgency against rule by India. India retaliated by launching a full-scale military attack on West Pakistan. The seventeen-day war caused thousands of casualties on both sides and also witnessed the largest tank battle since World War II. The hostilities between the two countries ended after a ceasefire was declared following diplomatic intervention by the Soviet Union and the United States, and the subsequent issuance of the Tashkent Declaration. Both India and Pakistan claimed victory. However, most neutral assessments agree that India had the upper hand over Pakistan when ceasefire was declared. The 1965 war exposed Pakistan’s inadequate training at all levels, misguided selection of officers, poor command and control arrangements, poor intelligence gathering and bad intelligence procedures. Much of the war was fought by the countries’ land forces in Kashmir and along the border between India and Pakistan. This war saw the largest amassing of troops in Kashmir since the Partition of British India in 1947, a number that was overshadowed only during the 2001–2002 military standoff between India and Pakistan. Most of the battles were fought by opposing infantry and armoured units, with substantial backing from air forces, and naval operations. The nation paid a befitting tribute to the spirit, valour and sacrifice of the 1965 veterans in particular who defied odds and played a major role in successfully countering our adversaries’ designs in 1965. 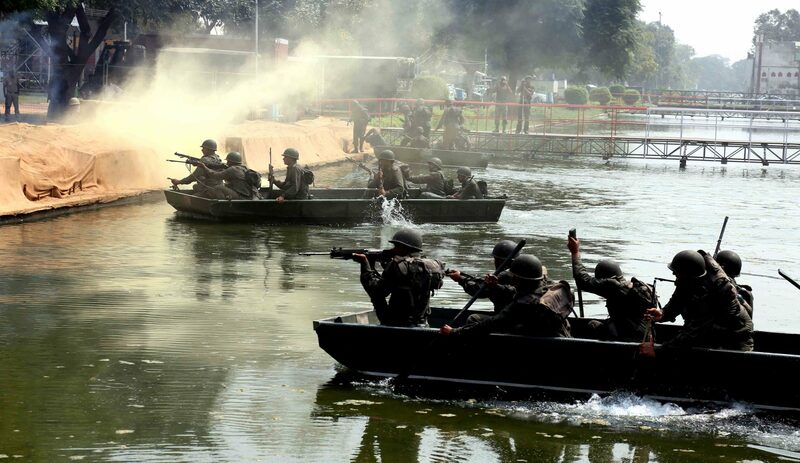 The Indian Armed Forces organised a series of events to mark the Golden Jubilee of the 1965 Indo – Pak War. A total of six events were organised to pay tribute to the collective resolve of the nation and the valour & sacrifice of The Armed Forces. The commemoration events were kicked off on 28 Aug, with the Supreme Commander of the Armed Forces laying a wreath at The Amar Jawan Jyoti. On this very day 50 years ago the Indian Armed Forces had captured the strategic Hajipir Pass in response to Pakistan’s Operation Gibraltar, aimed at wresting Kashmir by sending in armed infiltrators. This was followed by a two day Seminar on 01 and 02 Sep 15 where the lessons of the War were revisited. On 01 Sep 65, Pakistan had launched Operation Grand Slam to severe Rajouri and Punch from rest of the country. The exhibition titled ‘Shauryanjali’ celebrating the Golden Jubilee of Indo-Pak War of 1965 was staged at the India Gate lawns tin the capital. The exhibition was an ode to splendid show of valour and sacrifice of Indian Armed Forces personnel for protecting the borders of the country. 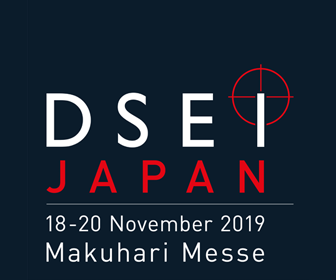 The exhibition recreated the battle scene in various sectors beginning from Rann of Kutch to the ceasefire and Tashkent Summit. The battle of various types are also on display at the exhibition. The Golden Jubilee Commemorative events of Indo Pak War – 1965 at New Delhi was initiated by the President of India Pranab Mukherjee by a Wreath Laying Ceremony at Amar Jawan Jyoti on 28 Aug 2015 who visited the exhibitions area depicting Terrain Walk Through, Battle Enclosures, Martyrs Gallery and other enclosures by arms and services, depicting the Indo Pak war of 1965 in its entirety. 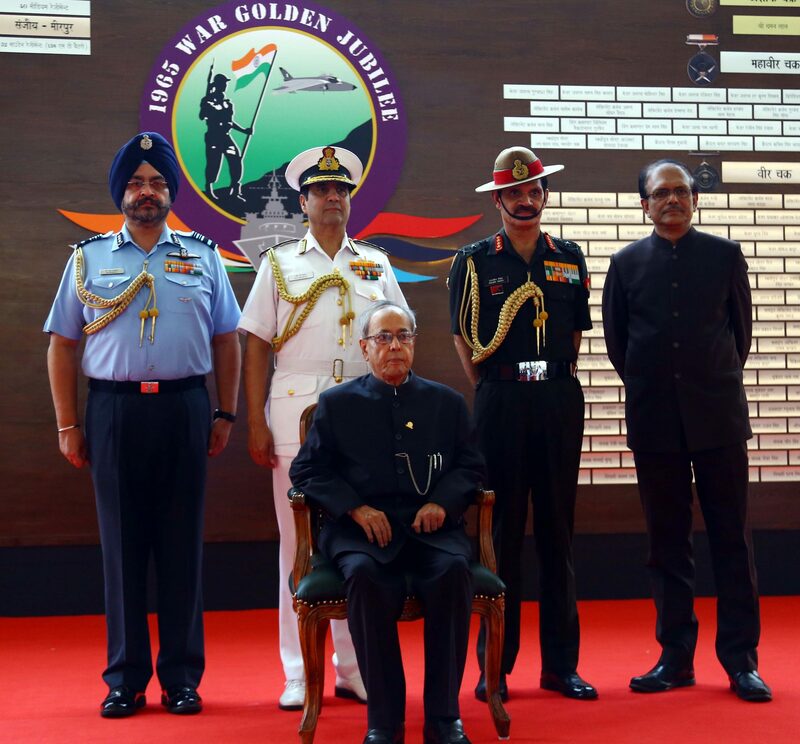 The President of India endorsed his remarks in the visitors book, stating “ A heart warming exhibition showcasing the grit and valour of the Indian Soldier. I salute the brave martyrs of the Indian Armed Forces who sacrificed their present for our today. 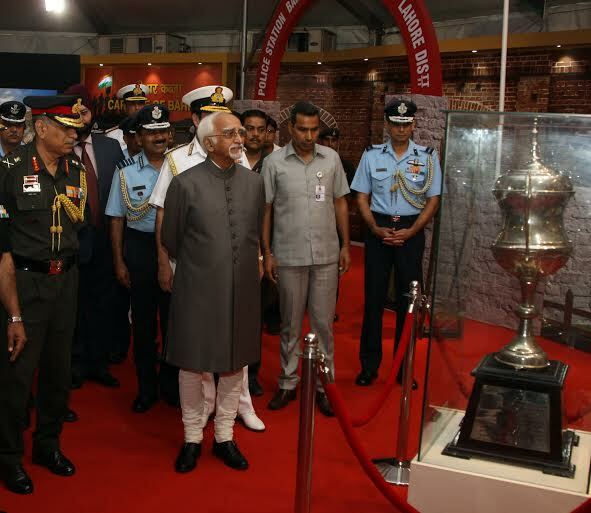 Every Indian should be proud to walk through this exhibition glorifying our victory in the 1965 war. 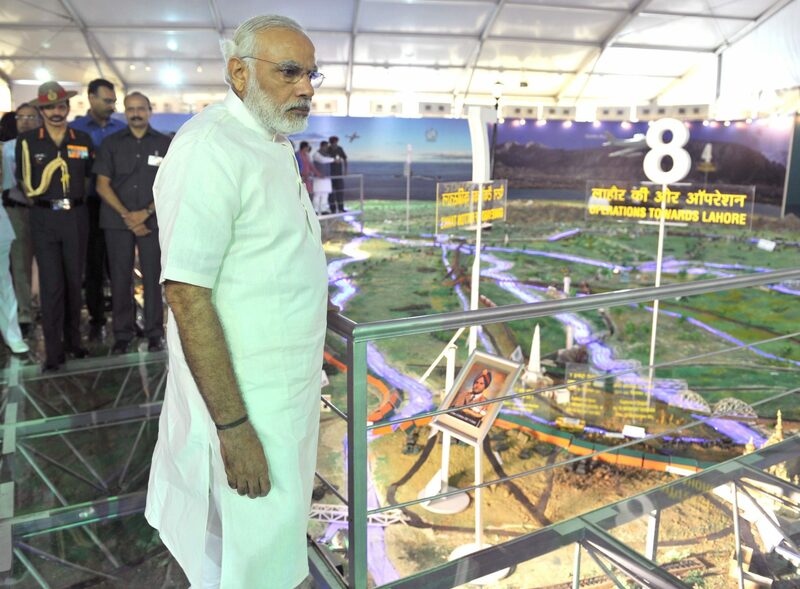 My compliments to the team for organizing this at such a grand scale”. 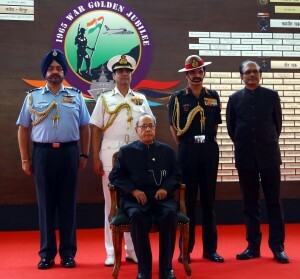 The President also interacted with the next of kin of the nation’s highest gallantry award winners of Param Vir Chakra during 1965 War, Lt Col AB Tarapore and CQMH Abdul Hamid and a number of war veterans of 1965 war. 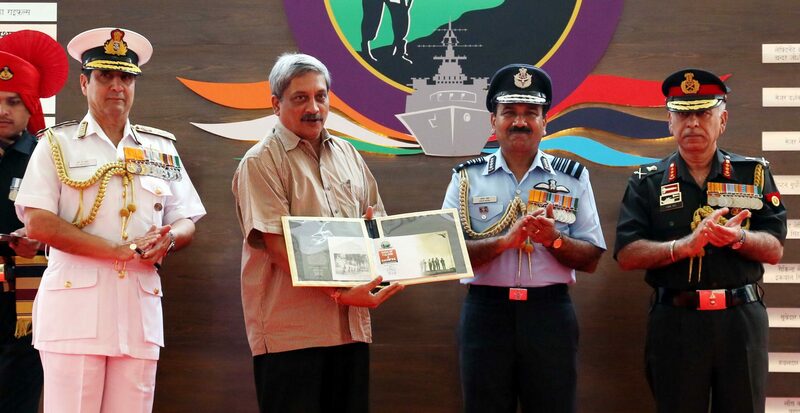 Releasing a special on the occasion the Defence Minister Manohar Parrikar said he was deeply influenced by the heroism of Company Quarter Master Havildar (CQMH) Abdul Hamid. 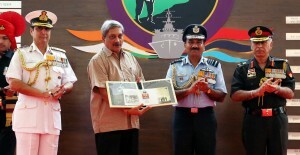 Shri Parrikar said that this was first major war that India won hands-down. He said a nation that remembers its history and its martyrs is a developed and secure country. A large number of veterans also attended the event. Among others Mrs Rasoolan Biwi – wife of PVC recipient CQMH Abdul Hamid, Mrs Asha Rani – wife of Ashok Chakra recipient Mr. Chaman Lal, Mrs Bharinder Dayal – wife of MVC recipient Lt Gen RS Dayal, Mrs Zarine Mahir – daughter of Late Lt Col. AB Tarapore PVC (Posthumous) and Mrs Earini Vaidya – daughter of former COAS Late General AK Vaidya attended the event. The visitors were enthralled by the Army personnel who enacted a battle near Ichogil canal 50 years ago in the Water Channels near India Gate. 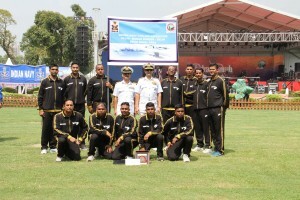 The event was attended among others by Chairman Chiefs of Staff Committee and Chief of Air Staff Air Chief Marshal Arup Raha, Chief of Naval Staff Admiral RK Dhowan and Vice Chief of Army Staff Lt Gen MMS Rai. Enclosures were also being established by CRPF, Media, Prasar Bharti and International Red Cross who had a major role to play during the War. 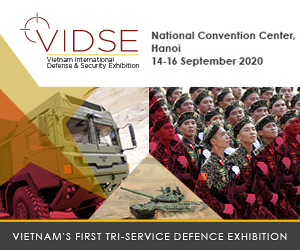 A documentary film on the War was also shown during the Exhibition. The Minister of Finance, Corporate Affairs and Information and Broadcasting Arun Jaitley said India scored a decisive victory in the War. 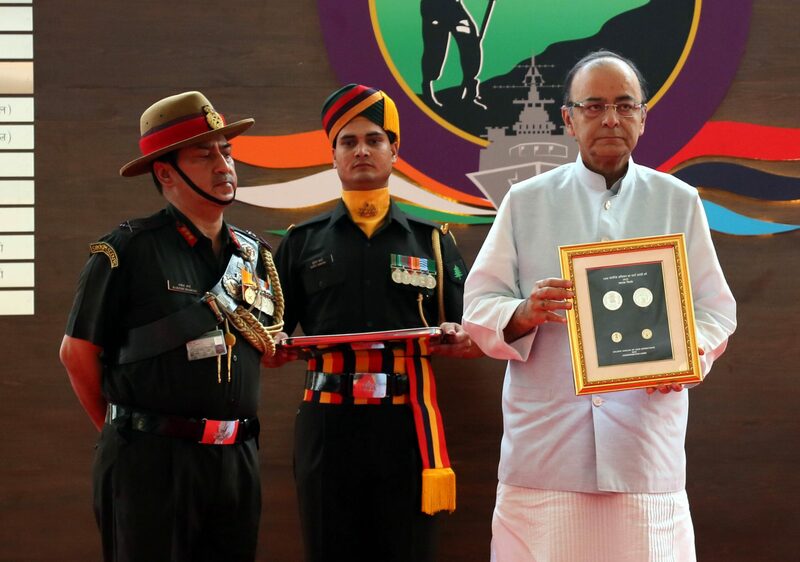 Jaitley described it as a nostalgic occasion and recalled the overwhelming, emotional and material support that it generated nationwide for the Armed Forces. 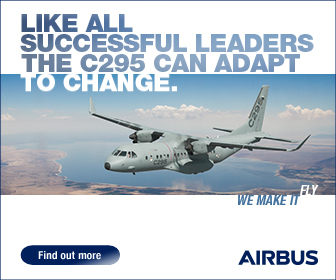 He said “the enemy was shown its place by the professionalism of our Armed Forces”. The Minister released two commemorative coins of Rs. 50/- and Rs. 5/- denominations on this occasion. The Minister for Information and Technology and Communications Ravi Shankar Prasad released a set of stamps and First Day Cover to commemorate the occasion. He said the 1965 War was an event marked by many stories of valour and sacrifice of our Armed Forces personnel. He recalled the clarion call ‘Jai Jawan Jai Kisan’ coined by Prime Minister Lal Bahadur Shastri and said that the nation rose in unison in support of our Armed Forces. Air Vice Marshal OEM Menon VSM, SOA WAC , flagged in the IAF Ultra Marathon and Microlight and twin Powered Hang glider (PHG) cross country expeditions at AF Stn Hindon on 19 Sep 15 at 1430 hrs. 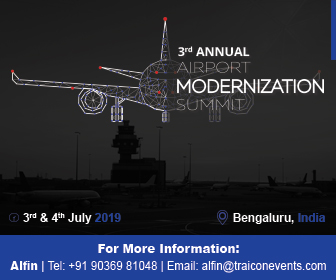 These expeditions were organized by the Indian Air Force as a befitting tribute to the valour and sacrifice made by the Indian Armed forces during the 1965 Indo- Pak war. The Ultra Marathon was flagged off on 09 Sep 15 from Pathankot and culminated at Hindon on 19 Sep 15 covering a distance of around 574 kms in 11 days covering major airbases enroute at Adampur, Halwar and Ambala. Seven air warriors participated in this extreme endurance event. Running an average of 55 kms per day, these bravehearts endured scorching heat, blistering roads and intense exhaustion and dehydration , drawing on their will power and motivation. They were joined by a large no of air warriors at the enroute air bases for distances upto 21 kms and 42 kms. 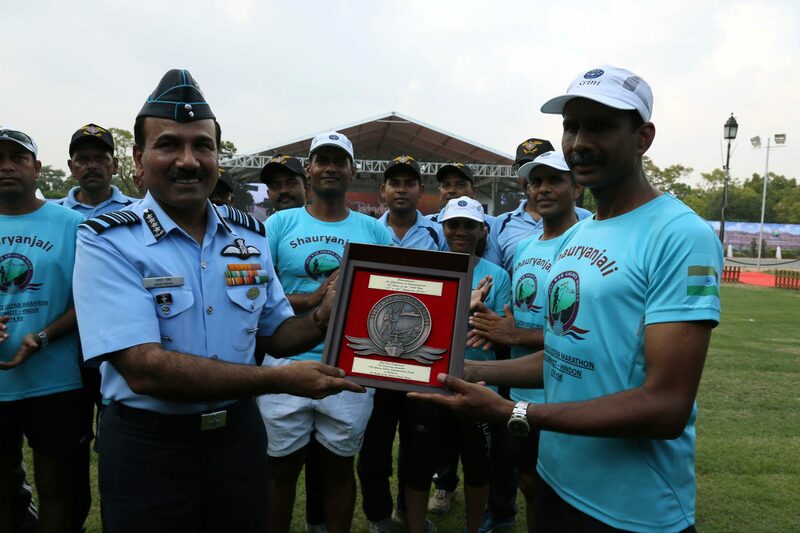 Gp Capt VS Choudhary VM, Gp Capt Arvind Tripathi, Sqn Ldr S Gayathri, and Cpl M Bishnoi completed the entire ultra marathon distance of 574 kms, overcoming blisters, cramps and heat exhaustion. Fg Offr S Dixit, Sgt GB Mishra, Sgt AK Yadav covered the distance in relay format and were joined by Gp Capt Manoj Kumar who joined the team from Ambala to Hindon covering a distance of around 240 kms. The Microlight and twin PHG expeditions were flagged on 16 Sep 15 from AF Stn Pathankot and AF Stn Amritsar respectively. These ultra light aircraft landed at major airbases of WAC such as Adampur, Halwara and Amabala and gave motivational joy rides to air warriors and civilians to introduce them to the thrill of aero adventure sports. The crew for the microlight comprised of Wg Cdr VS Shokeen and Sgt Sunil whereas the two PHGs were piloted by Sqn Ldr WS Singh, Sqn Ldr Ajmer Singh, Sgt ML Yadav, Sgt Ram Mehar and Cpl Dobhal. The 1965 war witnessed some of the largest tank battles since World War II. At the beginning of the war, the Pakistani Army had both a numerical advantage in tanks, as well as better equipment overall. Pakistani armour was largely American-made; it consisted mainly of Patton M-47 and M-48 tanks, but also included many M4 Sherman tanks, some M24 Chaffee light tanks and M36 Jackson tank destroyers, equipped with 90 mm guns. The bulk of India’s tank fleet were older M4 Sherman tanks; some were up-gunned with the French high velocity CN 75 50 guns and could hold their own, whilst some older models were still equipped with the inferior 75 mm M3 L/40 gun. Besides the M4 tanks, India fielded the British-made Centurion Tank Mk 7, with the 105 mm Royal Ordnance L7 gun, and the AMX-13, PT-76 and M3 Stuart light tanks. At the outbreak of war in 1965, Pakistan had about 15 armoured cavalry regiments, each with about 45 tanks in three squadrons. Besides the Pattons, there were about 200 M4 Shermans re-armed with 76 mm guns, 150 M24 Chaffee light tank and a few independent squadrons of M36B1 tank destroyers. Most of these regiments served in Pakistan’s two armoured divisions, the 1st and 6th Armoured divisions – the latter being in the process of formation. The Indian Army of the time possessed 17 cavalry regiments, and in the 1950s had begun modernizing them by the acquisition of 164 AMX-13 light tanks and 188 Centurions. The remainder of the cavalry units were equipped with M4 Shermans and a small number of M3A3 Stuart light tanks. India had only a single armoured division, the 1st ‘Black Elephant’ Armoured Division, which consisted of the 17th Horse (The Poona Horse), also called ‘Fakhr-i-Hind’ (‘Pride of India’), the 4th Horse (Hodson’s Horse), the 16th Cavalry, the 7th Light Cavalry, the 2nd Lancers, the 18th Cavalry and the 62nd Cavalry, the two first named being equipped with Centurions. There was also the 2nd Independent Armoured Brigade, one of whose three regiments, the 3rd Cavalry, was also equipped with Centurions. Despite the qualitative and numerical superiority of Pakistani armour, Pakistan was outfought on the battlefield by India, which made progress into the Lahore-Sialkot sector, whilst halting Pakistan’s counteroffensive on Amritsar; they were sometimes employed in a faulty manner, such as charging prepared defenses during the defeat of Pakistan’s 1st Armoured Division at Asal Uttar. After India breached the Madhupur canal on 11 September, the Khem Karan counter-offensive was halted, affecting Pakistan’s strategy substantially. Although India’s tank formations experienced some results, India’s attack at the Battle of Chawinda, led by its 1st Armoured Division and supporting units, was brought to halt by the newly raised 6th Armoured Division (ex-100th independent brigade group) in the Chawinda sector. The Centurion battle tank, with its 105 mm gun and heavy armour, performed better than the overly complex Pattons. After the war, a total of number of 16 battle honours and 3 theatre honours were awarded to units of the Indian Army, the notable amongst which are Jammu and Kashmir 1965 (theatre honour), Punjab 1965 (theatre honour), Rajasthan 1965 (theatre honour), Assal Uttar, Burki, Dograi, Hajipir, Kalidhar, OP Hill and Phillora. For bravery, Company Quarter Master Havildar Abdul Hamid (Posthumous) and Lieutenant-Colonel Ardeshir Burzorji Tarapore (Posthumous)were awarded the highest gallantry award Param Vir Chakra . ADU salutes the brave Indian soldiers who gave their today for our tomorrow in 1965.